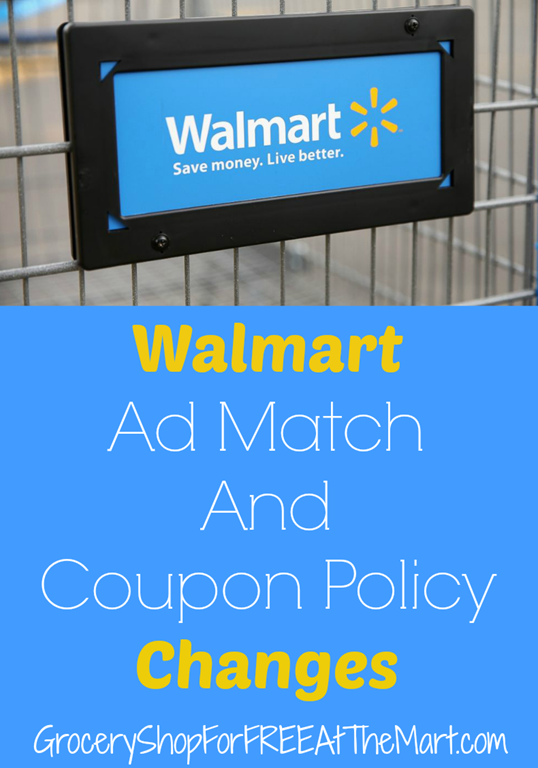 2014 Walmart Coupon and Ad Match Policy Changes! It figures that less than a week after teaching an hour long class going over the Walmart coupon and price match policies, Walmart would change their policies! The good news is that most of the changes are minor but there are a few things we need to discuss. If you want to know every single line and word that changed, Dian did an awesome job of that here so we are just going to talk about the most important things in this post. You can see the new Walmart Coupon Policy here, and the New Ad Match Policy here. This means that at any time for any reason, Walmart can limit the number of like coupons to one. You read that right, ONE like coupon. Why? Shelf-clearers. That’s right, if Walmart thinks you are clearing their shelves by using a bunch of coupons, they can shut you down. In fact, the register will automatically require a CSM approval anytime you use more than 4 like coupons on the same transaction. My advice? If you want to use more than 4 like coupons, divide it up into multiple transactions to avoid triggering that CSM call. I’d love to know what prompted this change now that the special Florida Ad Matching policies are gone but they can limit BOGO deals. I don’t think this will affect most couponers but I guess we will see going forward if this has any unforeseen effects. Remember that diaper deal that everyone knew you weren’t supposed to do but were doing anyway? Well, this one is on you. Now the item descriptions will need to be much clearer and precise for it to be a good Ad Match. So these are each more restrictive than the old policies. We already discussed the 4 like coupon policy above and there isn’t anything you can do about $5 coupon limit. You will either have a $5 coupon or you won’t. Same with the $50 total coupon limit. The one thing that is new and really unclear is that last line. I’m not sure if they forgot to put a percentage in that line or if it’s intentionally left blank so each store manager can set that bar as they see fit. Either way, that’s going to be a fun one. So that’s it. Several changes that will no doubt confuse the heck out of the average Walmart cashier for months to come. Let’s see how this goes!